The purpose of non-competitive lure coursing tests is to offer sighthound breed owners a standardized gauge to measure their hounds’ coursing instinct. The purpose of the competitive lure coursing trial program is to preserve and develop the coursing skills inherent in the sighthounds and to demonstrate that they can perform the functions for which they were originally bred. 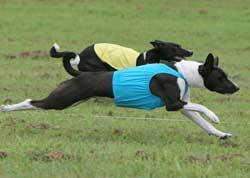 Although lure coursing events are artificial simulations of coursing, they are designed to measure and develop the characteristics of the sighthound breeds. Lure coursing tests and trials are sports and all participants must be guided by the principles of good sportsmanship both on and off the test and trial fields (Regulations for Lure Coursing Test and Trials Handbook, Chapter 1, Section 1, page 1). Sighthounds are a special group of hounds that are bred to hunt by sight. The sighthound breeds are: Whippets, Basenjis, Greyhounds, Italian Greyhounds, Afghan Hounds, Borzois, Ibizan Hounds, Pharaoh Hounds, Irish Wolfhounds, Scottish Deerhounds, Salukis and Rhodesian Ridgebacks. To provide a test for these breeds AKC instituted the Lure Coursing tests and trials in July, 1991. These Tests and Trials utilize a ‘lure’ of white plastic strung around a course of 600 to 800 yards in an open field. They are meant to preserve, test and develop the coursing instincts in these breeds. Your first step to learning about lure coursing is to get a copy of Lure Coursing Rules and Regulations and familiarize yourself with what is required to enter the various events offered. Dogs must be at least one year old to run at an AKC-approved event. Dogs with breed disqualifications are not eligible. Check the standard for your breed or the Lure Coursing Regulations for more information. 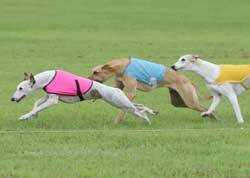 The lure coursing Tests offer the Junior Courser (JC) and Senior Courser (SC) titles. In the Junior Courser test the dog runs solo and is required to run at least a 600 yard course with four turns under two different judges. For the Senior Courser test the dog must be eligible to run in the Open Stake by virtue of having a Junior Courser title; must run with at least one other dog and must earn a qualifying score at four AKC tests under at least two different judges. To earn the Master Courser test the dog must earn 25 qualifying scores in the Open, Open Veteran or Specials Stake and have a Senior Courser Title. In the lure coursing Trials the dogs can earn a Field Championship (FC) by accumulating 15 points with at least two first place wins of three points or more under two different judges or judging panels and at least one point must be earned in competition with at least one hound of the same breed. Once a dog has earned an FC, they may continue to compete in order to earn a Lure Courser Excellent title (LCX). They must accumulate an additional 45 Championship points at which time they receive the LCX title. If they wish to continue to compete, they can continue to accumulate Championship points in increments of 45 and earn additional LCX levels, i.e. LCX II, LCX III, LCX IV, etc. To find out more information on lure coursing or sighthound clubs in your area you can find them through the Club Search and for information on lure coursing events in your area use our Event Search. 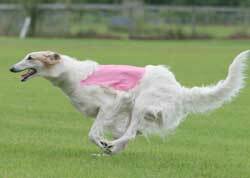 Coursing is a good way to keep your sighthound mentally and physically fit and nothing is more fun that seeing the sheer joy on your sighthound’s face as he courses his ‘quarry’ instinctively.